On Wednesday night, Esperanza Spalding performed at Herbie Hancock's 70th Birthday at the Hollywood Bowl in Los Angeles. "It was Spalding who wowed the crowd with an acrobatic, joyful duel with Hancock that knocked around the song's edges, showing she could more than hold her own with the veteran masters" remarked Chris Barton at the Los Angeles Times about Esperanza. Herbie Hancock on Keyboards Wayne Shorter on soprano saxophone, Jack DeJohnette on drums, Terence Blanchard on trumpet, Nathan East on electric bass and Esperanza on acoustic bass were the musicians who formed the jazz ensemble who performed at Hancock's birthday celebration. 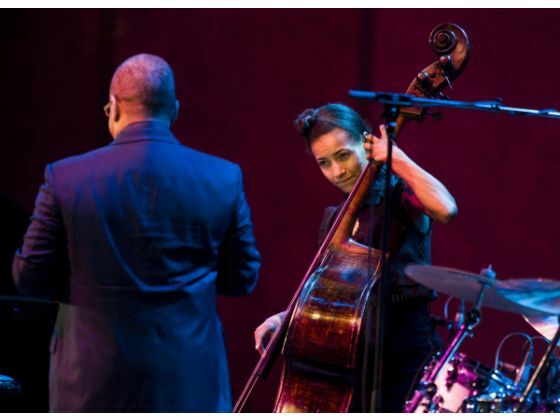 "Esperanza Spalding held her own among this storied ensemble" Paula Edelstein.